Shaun Adams, Procurement Manager, Marine Hydraulics International, Inc.
Kristen Bailey, Corporate Controller, Marine Hydraulics International, Inc.
Martina Brown, Cost Account Manager, Marine Hydraulics International, Inc.
Leah Gammons, Financial Accounting Manager, Marine Hydraulics International, Inc.
Brian Holland, Business Capture Director, Marine Hydraulics International, Inc.
December 9, 2014 - The 2014 Holiday Annual Membership Meeting at the Half Moone Cruise and Celebration Center DICKENS’ CHRISTMAS TOWNE was a great time for all who attended this year. Guests were transported back to Victorian London – a wreath on every door and a candle in every window. Actors dressed in period costume and brought the village to life. Merchants, tea parties, holiday activities, a Victorian Father Christmas and an impressive train display made the event a truly memorable evening. Boats decorated with lights and wreaths illuminate the nearby waterfront outside. This was truly an evening to be remembered fondly by all. Post by The Propeller Club, Port of Norfolk. Our special guest speaker John Reinhart, CEO & Executive Director of The Port of Virginia presented for the "State of the Port Update". The Propeller Club, Port of Norfolk would like to thank all of our members, sponsors, and guests for your continued support, and for making our Spring Oyster Roast a success! We are pleased to announce that the Honorable Duncan Hunter of California's 50th District will be the honoree at this year's Salute to Congress. The International Propeller Club’s annual Salute to Congress - our signature Washington, D.C., event - will take place on Thursday, May 8. Each year, the Propeller Club, Port of Norfolk, with our fellow clubs across the country, celebrates National Maritime Day. Established by Congress in 1933, National Maritime Day honors the work and contributions of past Merchant Seamen who endured the perils of the sea during times of war and peace, and celebrates and recognizes those who proudly carry on that tradition today. This year’s commemorative event, which will be held from 4:00 to 7:00 pm on Thursday, May 22 at the Elizabeth River Pavilion, located behind Nauticus and the Half Moone Cruise and Celebration Center, will include the laying of a memorial wreath and an informal reception with live music, hors d’oeuvres and cocktails. In addition to your participation, we would greatly appreciate your financial support as a sponsor of National Maritime Day 2014 at the Commander in Chief, Admiral, Commodore, Captain or Mate level. 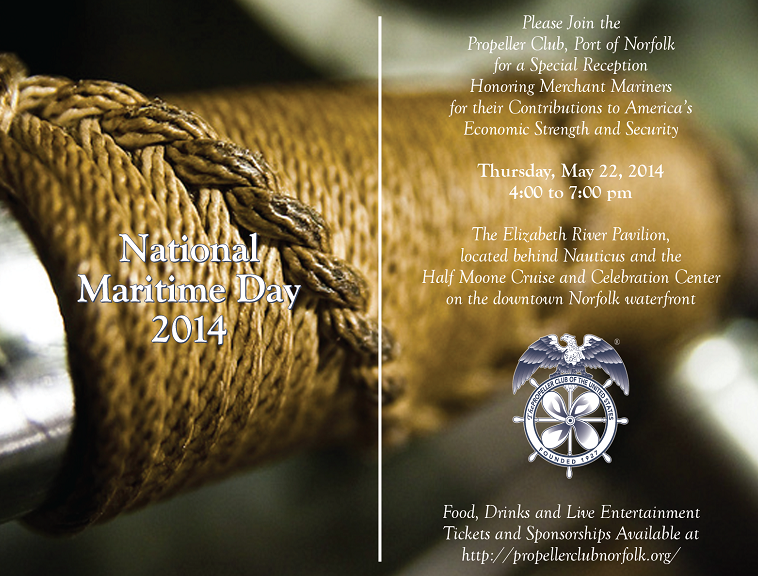 Additional details about National Maritime Day 2014 are located on the event’s webpage at http://propellerclubnorfolk.org/events?eventId=854364&EventViewMode=EventDetails. The Propeller Club of Norfolk is a proud supporter of the first Sail Nauticus called SailQuest. SailQuest is an after-school program with Norfolk Public Schools and Portsmouth Public Schools. Click here to view the thank you letter from Nauticus. More information about SailQuest, please visit http://www.nauticus.org.